The Bond BullPup9 Is Finally Here! Very Limited Production Only 150 per Month Available, and They Are Going Fast! Get Yours Now. This is an ultra-compact 9mm. The new BullPup9 is the only Bullpup Style handgun on the market. The Bond BullPup9 is a double-action only, hammer-fired semi-auto handgun designed for discreet concealed carry. It features a rotating barrel locked breech and reverse feeding system unlike any other sub-compact 9mm currently available on the market. Swimming upstream against the proliferation of polymer-framed pocket pistols, the handgun has an anodized aircraft aluminum (7075 for purists) frame paired with a bead blasted stainless steel slide. The BullPup9 is chambered for 9mm Luger cartridges. Bond Arms cautions that excessive use of 9mm +P ammunition could shorten the service life of the pistol. The matte black anodized frame and bead blasted slide is flawlessly done. 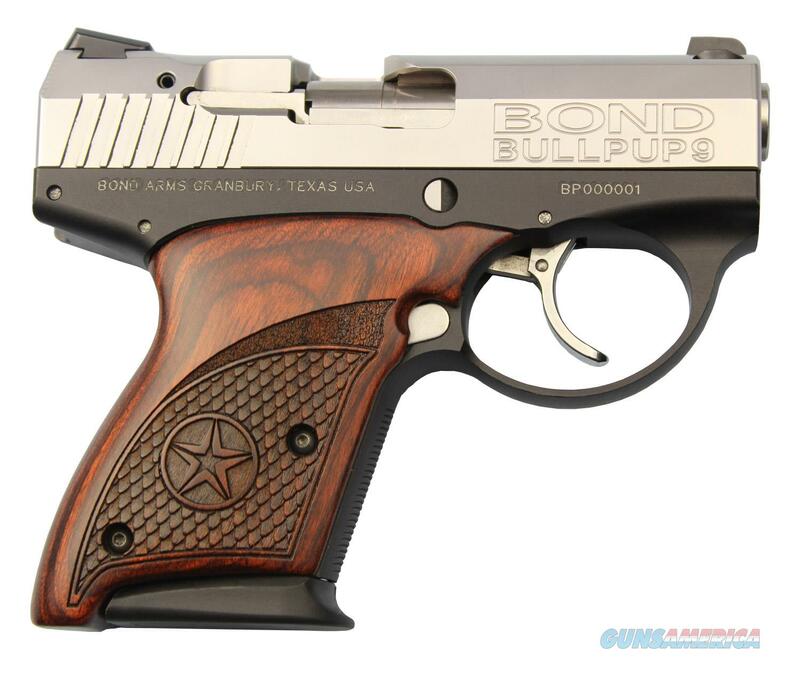 The Bond signature rosewood laminate grips and polished stainless steel accents enhance the overall look of the pistol.